The Volga German colonists carried to Russia the traditional folk and religious music of their German homelands. Although there were no songbooks with notes in the Volga colonies, the music lived on in the memories of older people and was constantly renewed through the singing of younger people. And so, the music of the Volga Germans was passed down from generation to generation and carried again to their new homeland in America. 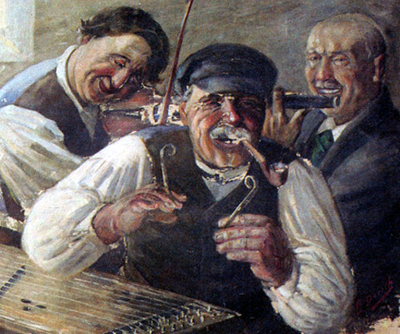 Painting of Volga German musicians. leave behind there deepest tracks. Bands would play on festive occasions such as holidays and weddings. Commonly used instruments were the Hackbrett (hammered dulcimer), Zieharmonika (accordion), violin, and various brass instruments. The accordion was invented about 1845 in Vienna, Austria and it would have taken some time for it to find its way to the lower Volga region. Prior to that time, the violin provided the primary structure to the music. Traditional Volga German polka music and dance became known as Dutch Hop in many parts of the midwestern United States and Canada. The word Dutch is a misnomer that most likely came from a misunderstanding of the word Deutsch (German). Many Volga Germans say their ancestors deliberately ignored the misunderstanding because of the widespread anti-German sentiments they encountered during World War I and World War II. As a result, the music remains known as Dutch Hop to this day. Although the music was the same, the term Dutch Hop doesn't seem to have been in common use in the Portland community where the performances were typically known simply as "German Dances". The best known Volga German musician in Portland was Billy Starkel. ​Billy played regularly in Las Vegas, Los Angeles, Honolulu, and for many years at the Hilton Hotel in Portland. Billy's father, Henry Starkel, was an accordion player who performed at weekend dances in a large hall above Weimer's Hardware and Furniture Store on Union Avenue. Billy Starkel also led a local Vaudeville style act known as the "Volga Warblers". The group of eleven members included Pete Beech, Wally Borgens, Bill Krieger, Pete Koch, Adam Koch, Al Macht, John Ehrlich, Pete Hohnstein, Mr. Baker, and Jack Deines. 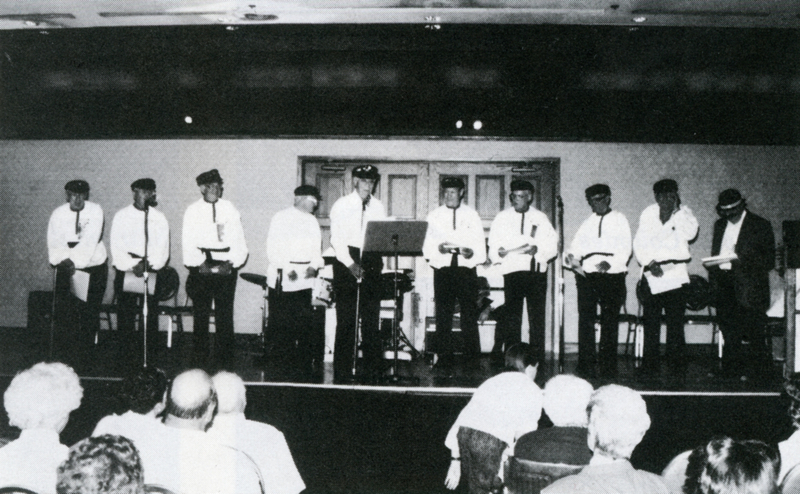 The "Volga Warblers" performing at the 1987 American Historical Society of Germans from Russia convention held at the Red Lion Inn - Lloyd Center in Portland. Billy Starkel stands at the far right. Courtesy of the Oregon Chapter of AHSGR. Early, Dean. "Gun-music trade pleases Starkel." The Oregonian, February 5, 1975. A15. Starkel, Randy. "​Short Stories About My Father, Billy Starkel." "Portland musician Billy Starkel dies; career included radio, hotel bands", The Oregonian, Thursday January 21, 1988, pg. E5. Last updated March 18, 2018.